Benchmark Foam prides itself on having the industry’s only On Time Delivery Guarantee, which plays a key factor for customers with strict schedules. Recently, a customer ordered a half truckload of sub slab expanded polystyrene (EPS) that needed to be delivered within a few days. To keep all parties on schedule, Benchmark Foam delivered the order without any problem as promised. Offering a variety of sub slab products, Benchmark Foam aims to please any contractor’s needs. Perhaps the most traditional, yet versatile way is in the form of 4’ x 8’ high density EPS foam sheets. Commonly used in sub slab applications, EPS is a cost-effective solution compared to others in the marketplace. 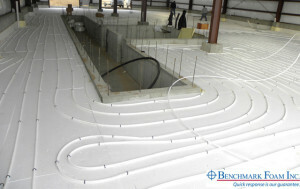 When staples are used to secure pex tubing in traditional in-floor heat systems, EPS holds a better grip than competitor sheets, resulting in a more stable system once concrete is poured. When tested, staples held considerably stronger in EPS compared to XPS. Next time your job requires sub slab insulation, call the Benchmark Foam team at 800-658-3444 or 605-886-8086 to find out how its EPS can be a cost-effective, yet durable solution.